So sorry that we haven't updated and it's already this late!! Oh no! Well, as you might know, class has started and I'm gonna face my finals soon (yes, I'm a college student) and I've just been pretty busy lately, still, excuses are excuses nevertheless..but I'm back now! And today, it's gonna be about yet another new restaurant! Located in SCBD's Fairground Plaza, it's next to Blumchen Coffee but to get there, you'd have to go through this beautiful alley! Because the name is Hide & Seek, guess that's why the place is also a bit hidden. I wouldn't have notice the place myself if it wasn't for the instagram post I saw! Yeap, I found out about this from instagram and was super curious cause of how cool the place is! You'll find out about the coolness of this soon enough! Personally think that in Fairground, each restaurant has their own design, like in Blumchen is vintage and now here, it's an industrial, steam-punk kind of interior! Wow! Since it's steam-punk, most of everything is made out of steel and metal, also a little bits and pieces of machinery! The place is spacey enough for a perfect hang out place, yet not as much for a family dinning cause of the eccentric theme! As you can see, each table has an ashtray, which indicates that the place is free-to-smoke kind of place..not really my kind of comfy area but good thing there wasn't that much people when I came, so the smoke was still tolerable! My FAVORITE corner!!! Ta-da!! Love this spot a lot, it kinda has a retro feel mix into the steam-punk and the sofas are perfect and comfy! Another plus here is because of the natural light it has! Unlike other restaurants, this place has more sofas than normal chairs, which is again, why I said it's more suitable for hanging out! 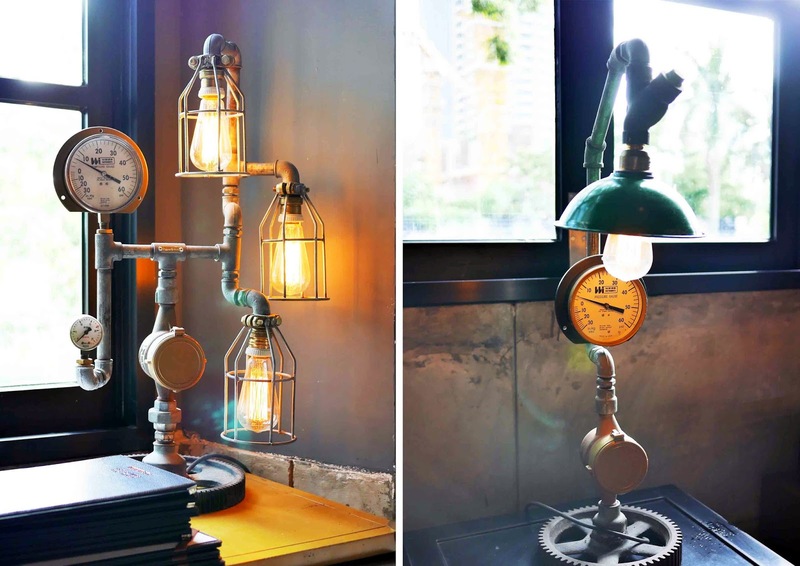 The table lamps just screams out industrial and did they made it by recycling used items? Cool! The magnificent bar! Amazing, isn't it? That masterpiece in the center is really eye-catching, it's like the motherboard of a robot! This particular spot is in a secluded room, which is for a more private 'activities' *wink wink* lol! Just kidding, I don't know what it's for, maybe a private meeting or something like that? Is it just me or is flavored ice tea just keeps getting more and more pricey? 40K for an infused ice tea? I really thought that it has something special in it but turned out, it's just your everyday flavored ice tea! Rather than the ice tea, I'd suggest this cold pressed juice instead, especially the mango!! Really sweet and refreshing that I kinda suspect that they used sugar or something! Well, all I know that it's yummy! Pork belly comfit with Chinese spices & herbs served with aromatic herbed couscous, kecombrang, lemon grass chutney & sauteed onion flower. They actually have 2 styles of pork belly here; pan seared and Chinese style, I wanted to order the pan seared but it's not available that day!! No!! Still not giving up with pork bellies, I decided to go with this one. In truth, this pork belly is too salty, I think it was suppose to be eaten with a mix of the risotto below but the looks of it was kind of a turn off, so I decided to leave it out. The taste of the Chinese herbs was too strong for me and I don't suggest this menu if you don't like strong Chinese aromatic herbs! The spices on top of the pork belly here is also the cause of the strong herb flavor, which I'd move away immediately! Sweet soya, scallion, Asian all spices. This chicken wings was also way too salty! Don't know if it's because of the chefs or is the foods here are suppose to be like that, but considering I like salty foods, I was able to tolerate these! What bothered me was not how salty it is, instead it's the whole seasoning! My friend said that it was good though, which might just be because I'm not fond of this kind of spices! Spaghetti in creamy salted duck egg sauce, champignon mushroom, cherry tomato & fresh basil. The taste of salted egg was so overpowering but not the salty salted egg..confusing huh? It's like the yolk part of the salted egg, did that help? No? Well, then you have to try it for yourself! You might be shocked by the fact that I ordered something that doesn't have meat in it, I just wanted to try this, since the name is interesting and I didn't regret it either cause the mushroom is really yummy and that's good enough to substitute the meat part! All of the dishes here has a really unique and strange taste, yet isn't that the beauty of food adventure? To get to try many crazy foods and I certainly think that it was all worth the try, especially with the amazing interior! I'd totally recommend this place for a photoshoot!